I’m all about doing things the easy way while still getting fabulous results. I’m not saying I cut corners, but sometimes one way of doing things is much easier than another. 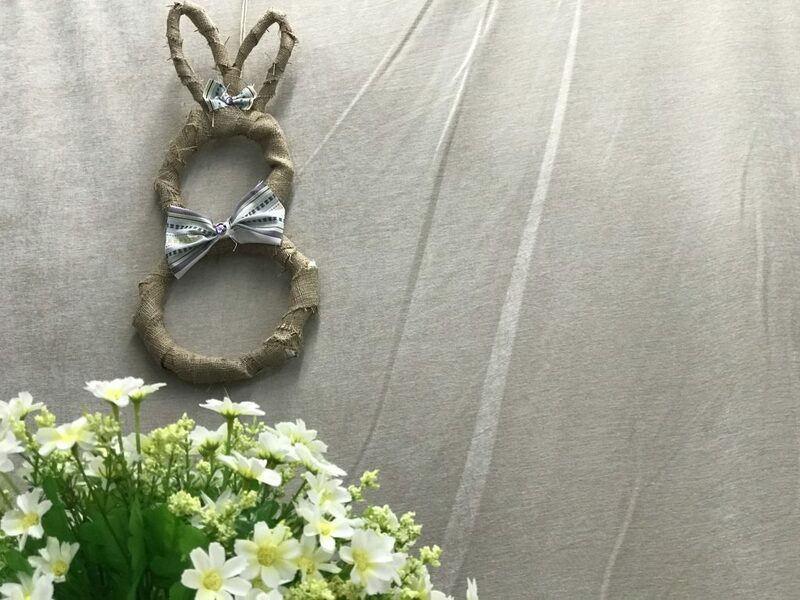 This fabric wreath is just that–a fool-proof project that’s so adorable, it’s Pinterest worthy. 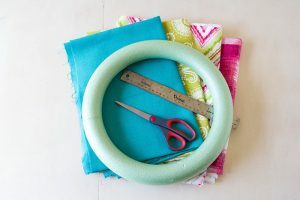 We’ve put together a simple tutorial so you can make your own fabric wreath in just a few steps and a couple hours. Select four coordinating fabrics to use for your wreath. 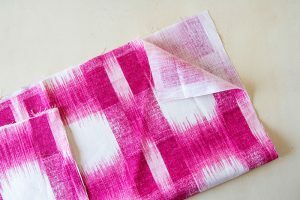 I chose magenta, lime green, turquoise and a pattern that ties them all together because, in my opinion, these colors are perfect for spring. However, you can choose fabrics that fit any season or holiday! Cut off the selvage from the edge of the fabrics. After you remove the selvage, fold each of the fabrics long ways. Then fold them into equal thirds. 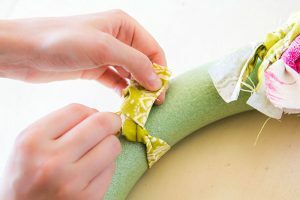 Cut along all the folds on the top, bottom and sides so you now have six pieces of fabric stacked on top of each other. There should be no folds when you are done cutting. Using your ruler or measuring tape, measure between 1 1/2 and 2 inches at the bottom of your fabric squares. You can use a pencil to mark cut lines or you can just eyeball it, which is what I did. I used the lines in my fabric to help me cut straight. Cut directly up until you reach about 14″. 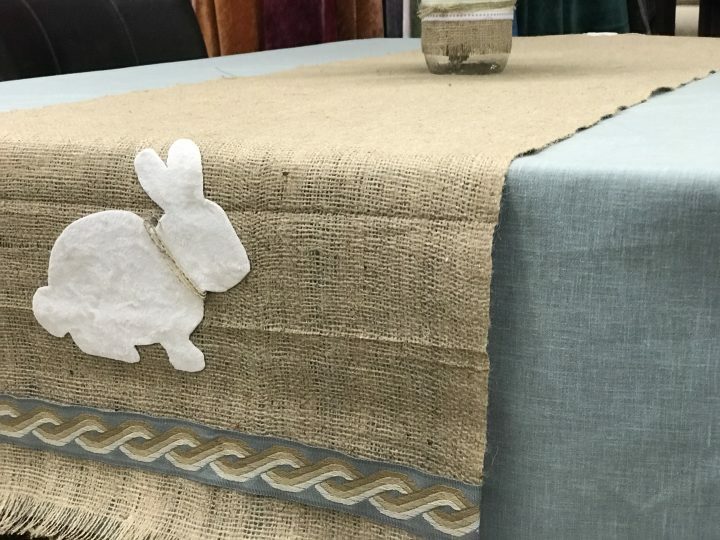 Keep doing this until you cut all the fabric. When you are done, you should have about 25-30 strips. 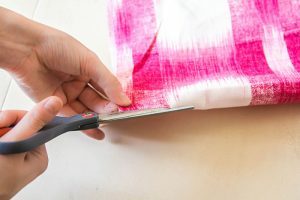 Quick Tip: Keep your fabric stacked as you cut the strips. This will make the process go much faster! 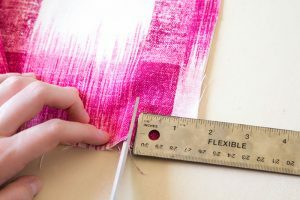 Fold each of your strips in half long ways to hide the white or off-colored side of your fabric. If your fabric is symmetrical on both the front and back sides, you do not need to fold your strips. Tie each of your strips around the wreath. I chose to tie mine in clusters of two, three or four of the same color. I found this allowed for bigger pops of color. However, you don’t have to copy me. Choose whatever pattern you like! After you’re done tying, adjust the knots by gently tugging and twisting so they aren’t all lying the exact same direction. 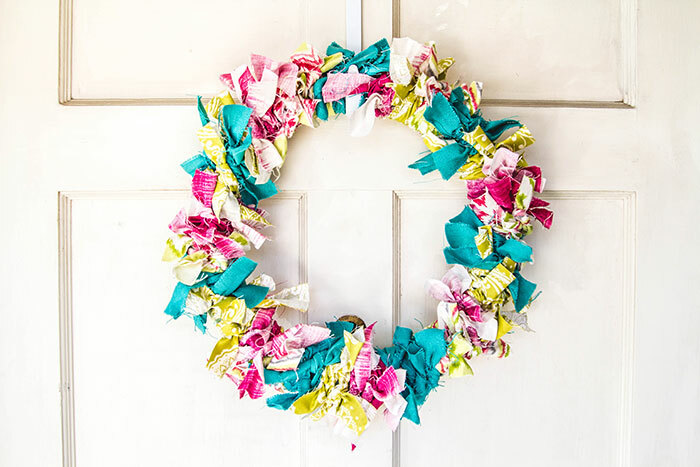 This will make your wreath look much fuller! Now all that’s left to do is hang your wreath on the front door or place it on your mantle with some coordinating decor. See? I told you it was easy! What do you think of this wreath? 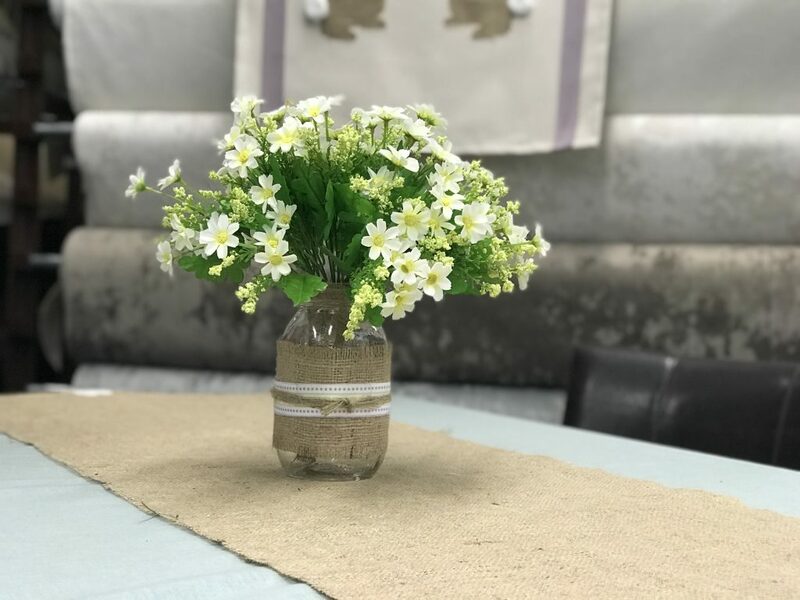 If you have any questions or comments, leave them below or send them to marketing@fabricdepotaz.com. We’d love to see your wreaths!